Like Indiana Jones, I've used my trusty Urbanspoon app to find the nearest feedery. Another chilli-fest. Half the things on the main menu list chilli as an ingredient. I normally don't photograph bread, but this is different. 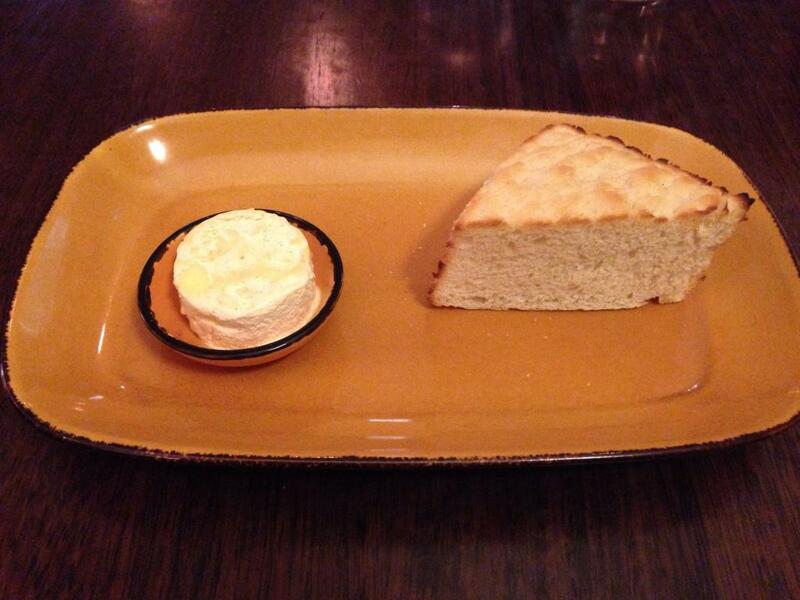 All ye old cobbers will remember bread and dripping from before butter was invented. It's pig fat, but this one has salt and paprika added. 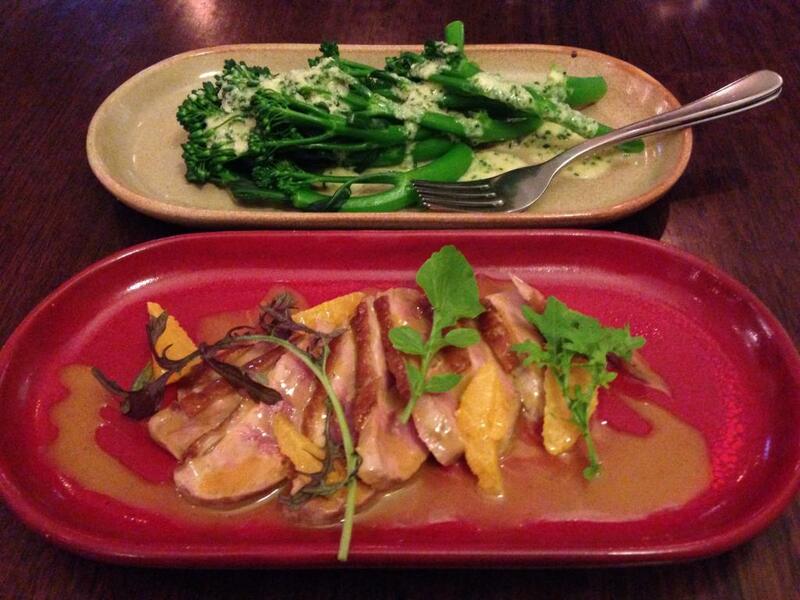 With side serve of broccolini and almond. I'm always on the lookout for "chicken duck". This is where duck is cooked like chicken, and might as well be chicken. This duck passes the test. The orange is a nice taste here, but the sauce on the plate is sweet, and very much tastes like dessert. It's very strange. It's like eating duck with caramel topping. I don't taste any cardamom, but I could swear there's cinnamon in here. At least the broccolini is good. Its curdled cheesy and lemony sauce adds some bite and flavour. The waitress tells me there's not supposed to be any cinnamon here, but she checks with the chef anyway. Waitress returns. The cinnamon is supposed to be there. With rhubarb and fresh basil. I've had a basil pannacotta before, elsewhere. It's an interesting taste, and it works surprisingly well. The pannacotta is very sloppy, but it has a basil taste. It's not an outstanding and powerful taste, but it's pleasant. 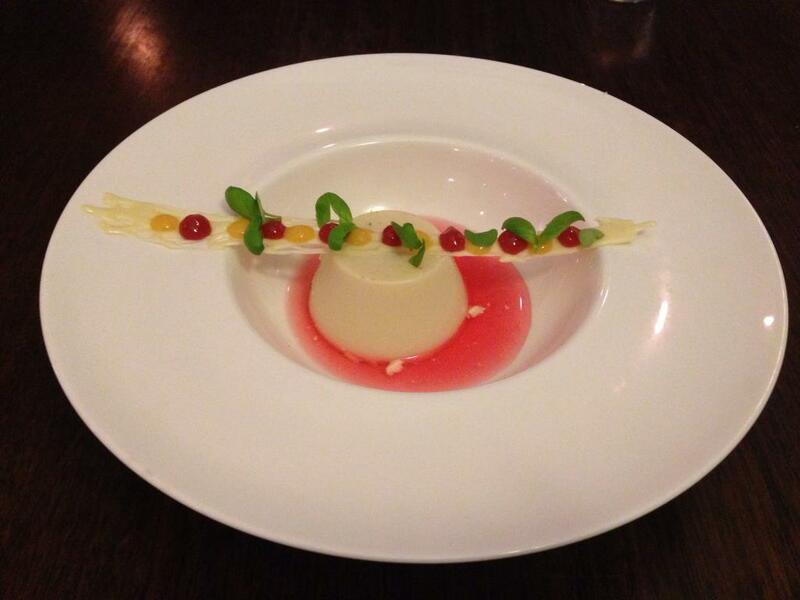 The panna cotta has a white chocolate base, which is adversely affected by having sat in liquid. The liquid has stripped away the creamy part of the chocolate, and left a grainy remainder. The white chocolate bridge across the plate doesn't have this problem. There are some dots of rhubarb, but they disappear into the stronger basil taste.